iOS 9 brought a brand new app switcher that looks significantly different from the one found in previous versions of the operating system. However just like before, iOS does not allow users to change any aspect of the stock multitasking screen, this of course becomes untrue if you are jailbroken. The new SwitcherTweak, which is still in beta allows users to change the scrolling direction of iOS 9 app switcher, significantly changing its overall look and feel. With SwitcherTweak, you can have app cards scrolling in all four directions as options include up, down, flipped, and naturally the default scroll direction. When you are using up or down layouts for the app switcher, you have to swipe right or left respectively to quit apps. After changing the direction make sure to hit the respring button to make the changes take affect. 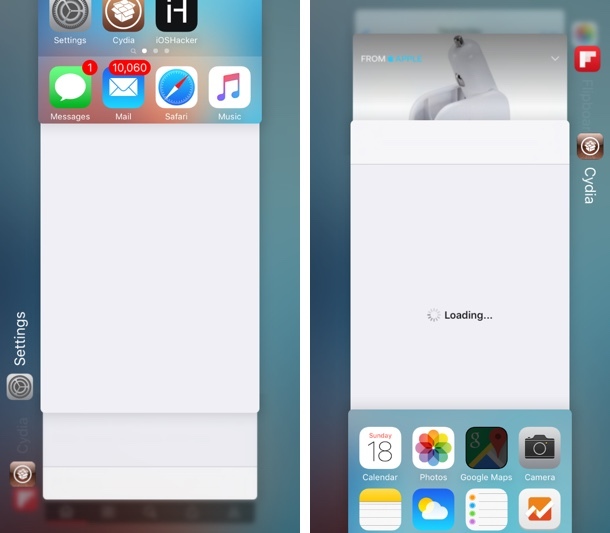 The tweak also offers an option to disable the blur effects found on the app switcher by default. Disabling them can improve the performance of the multitasking screen. You can disable page blurring, background blurring, springboard page blurring and hide page labels. Since SwitcherTweak is still in beta, you can download it from developer’s own repo for free. To install simply add ‘http://skylerk99.github.io’ to your Cydia sources and search for it.